Gillbrand announced her decision on CBS’s The Late Show with Stephen Colbert, saying she is filing her exploratory committee for the White House on Tuesday evening. Sen. Kirsten Gillibrand speaks to supporters during a 2018 election night watch party hosted by the New York State Democratic Committee. She is the second senator to enter the Democratic primary, after Massachusetts’ Elizabeth Warren announced an exploratory committee on Dec. 31. Several other Democratic senators are also eyeing bids, including Kamala Harris of California, Cory Booker of New Jersey and Amy Klobuchar of Minnesota. Former Housing and Urban Development Secretary Julián Castro is also running, as is Hawaii Rep. Tulsi Gabbard. Gillibrand was appointed to the Senate in 2009, succeeding Hillary Clinton when she became secretary of state. Before that, Gillibrand served one term in the House representing the Albany area. She won a special election in 2010 to finish out Clinton’s term and was re-elected in 2012 and 2018. 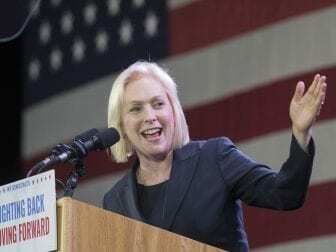 In a debate last fall, Gillibrand said she would serve out her six-year term, which if she were to win the race for president, she would not do. Gillibrand’s previous work on sexual assault and gender equality led to her becoming a leading voice in the #MeToo movement on Capitol Hill. In 2017, she was the first senator to call on Sen. Al Franken, D-Minn., to resign after he was accused of sexual misconduct. That provoked the ire of some Democrats, who saw Franken as a progressive hero standing up to Trump and said that Gillibrand had rushed to judgment before the accusations against Franken had been vetted. Politico reported that could hurt her with some potential donors in a presidential campaign. She told CBS’s 60 Minutes last year that she was “wrong” about her previous stances on gun control and was “embarrassed” by them. “What it’s about is the power of the NRA and the greed of that industry. Let’s be clear. It is not about hunters’ rights, it’s about money,” Gillibrand said.